All payments must be made in Singapore dollars in the form of local cheque, bank transfer or GIRO arrangement. 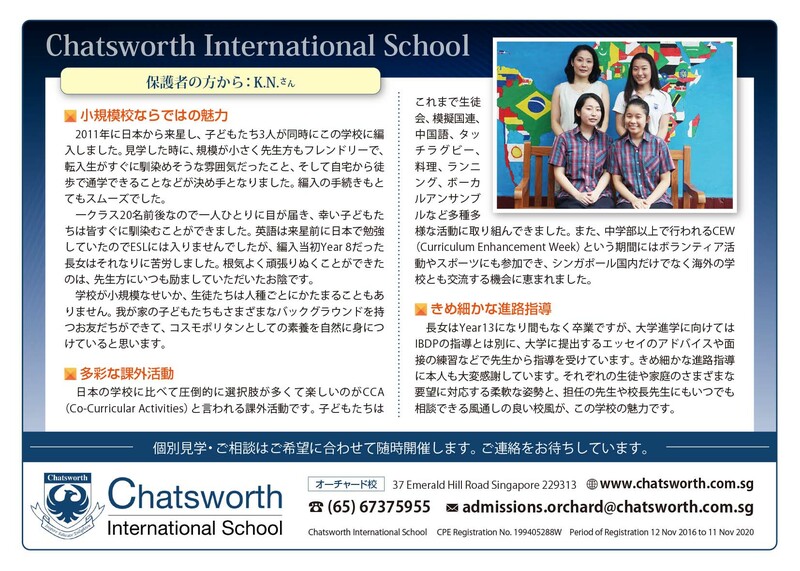 Please make cheque payable to Chatsworth International School Pte Ltd and mail it to Admissions department, 37 Emerald Hill, Singapore 229313. Please email to information.orchard@chatsworth.com.sg if you would like to pay by Paypal. A payment link will be forwarded to your email address. Chatsworth International School is a member in good standing of, and/or holds accreditations with the following organisations. Chatsworth’s Early Years Programme draws from the first of three programmes of the International Baccalaureate (IB) education - Primary Years Programme (PYP). It is a curriculum framework designed for students aged 3-12 years. The Early Years component is for children in their preschool years, typically from 3-6 years old (K1 to Year 2). At Chatsworth, we recognize that not all learning takes place in the classroom. Students in the Early Years take advantage of our spacious outdoor areas and facilities to explore the world around them. Students also participate in field trips throughout Singapore when authentic links can be made to our units of inquiry.